Tuning is the exact adjustment of the pitch for each of the strings that correspond to the 88 keys on the piano. Because there are approximately 225 strings on a modern piano, each at an average tension of 150 lbs or more, there is upwards of 35,000 lbs of tension being exerted on the entire piano. 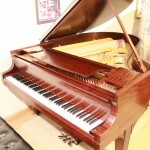 Anything more than the slightest change in pitch, and therefore tension, on all of these strings will be compounded to impose relatively large changes in the overall tension of the piano. This change in overall tension will slightly distort the piano’s structure, causing the pitch of previously adjusted strings to drift. For this reason, fine tuning may require multiple passes over the whole piano to produce a result that is both stable and predictably in tune. This process of multiple passes is called pitch correction. Mark uses a hybrid system of tuning, utilizing high level aural skills accumulated over more than 3 decades, along with an ETD (Electronic Tuning Device). 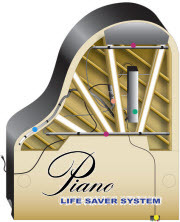 Using both allows him to produce customized tunings to fit the piano, the room, and the player. Most tunings are made in three passes, the first to place each string close to its final pitch, the second to make fine adjustments using the dual methodology, and the third as a final check for accuracy. The resulting accuracy and stability enures a satisfying playing experience, and potentially the refinement of the player’s own pitch awareness. As a routine part of tuning, Mark will assess the general condition of your piano, making note of any subtle issues which may require attention. He will also advise on the space in which the piano is kept, with recommendations for reducing the environmental impact of that space on the instrument.